Everything in the trip went really well, to the point I was very sad leaving Gabon and actually checked how much would it be for me to change the flights and stay there for some extra weeks. Can't wait to start planning the next one! I'll go through my photos the next couple of days and select the best ones to send you of Moukalaba Doudou National Park. The trip went very well and we were very happy to do this trip to Gabon. It was far from easy (as expected) but the long time spent in the forest allowed us to see many of the existing wildlife. We went also on some night walks and these revealed many of the desired species (such as crocodiles, snakes, Potto, and several civet cats in the trees). The guides were very friendly and had eyes like leopards. They saw everything and helped us to take nice pictures. This was truly a trip of a lifetime and we will definitely think about you and your organization the next time we plan a trip to Africa (next destination could be Congo). Without even meeting you, we have full confidence in you and your organization. You make dreams come true, so therefore we could not thank you enough for organizing this trip." First, let me commend you on the wonderful trip that you designed. Absolutely no complaints. The car you provided was also perfect for the drive. Crossed rivers easily, even when the water level was quite high. It had plenty of power! The Zambia road trip was the most expensive trip we have ever taken, and believe me over the past 40 years we have seen a large part of the world. However, after we had a chance to experience the country we understand why the lodges and camps have to charge what they do. I do not believe the costs were out of line. It takes many people to maintain the camps. Thank you for setting up and organizing this trip for us. It was a memorable one and we experienced nature at its best. Hope to meet you in person someday. Thank you for organizing our African adventure. We can't believe that our trip to Tanzania is over but we have many great memories. Everything went well with the accommodation, meals, transfers. We were so fortunate to have Lyimo as our guide/ driver...what a gentleman and an eagle eye for finding some of the wildlife (the cheetahs, leopards and even rhinos were hard to spot). It was sad to say good­bye to him but he will be a part of our fond memories of Tanzania. In the previous two years, and after working at the Mpongwe Hospital in the Copper Belt in Northwestern Zambia, we have concluded these journeys with 10-14 days private safaris, well arranged by Mama Tembo Tours in Lusaka. She organized a tour in a Toyota Land Cruiser with a private driver. Our trips consisted of 3-4 visits (1-3 days) to different national parks with a day of driving between the camps. Leslie Nevison has been a most helpful operator in creating a highly varied journey, well adapted to our taste and wishes. You might wish to consider using her services when preparing for travel to Zambia. I wanted to let you know just how much we appreciated the care you took planning the safari part of our trip. From beginning to end it was a remarkable, "once-in-a-lifetime" experience. The accommodations you selected were perfect. The tented camp experiences were truly thrilling, and the Tarangire and Kiratu lodges were amazing. The beauty of these settings is beyond something even our hundreds of photographs can capture. More than anything though, we appreciated the staff we met at these camps and lodges. Without exception, we were made to feel genuinely welcomed, cared-for, and safe. We left every place with a bit of regret that we didn't have more time to spend with the people there. Our times in these places will be among the most important and lasting memories of the safari. Thank you Leslie, for coordinating this journey. It is through your efforts that we have had such a rewarding and life-enriching trip. Alex and I returned to Germany last Monday. We are still in the process of "digesting" the most incredible journey we have done so far in our lives. We absolutely loved every moment of it. From Virunga, Brazzaville, Nouabale, Sangha and Conkouati. It was truly amazing! In this regards, thanks for all efforts and the entire organization. Everything, literally, everything worked out perfectly. When Canadian Airways Congo cancelled our flight from Ouesso to Brazza at the day of departure, a friendly women at the airport put us on some chartered TAC flight that would land in Ouesso to pick up some local business and politics man. Everybody was very eager to help us in all regards. Also many thanks to Steve, who was very helpful and gave us a city tour when we arrived to Brazza. Leslie, a chance for the dust to settle, after getting home on Tuesday and, finally, a chance to thank you for such a brilliant organization of this extraordinary glimpse of Northern Tanzania. It was a trip of a lifetime and all the sights and adventures far exceeded my wildest imagination. We could not have explored so seamlessly without the guidance of Lyimo. He smoothed the way, everywhere, anticipating all of our questions and needs. He has an enviable knowledge of birds and happily shared his enthusiasm and interest with us, never seemingly to tire of the endless barrage of questions. Our variety of tented camps and accommodations were wonderful and different and even the challenges of Lake Natron, provided some laughter and sense of adventure. Lorena and I particularly enjoyed the champagne sundowners on the dunes, served with such grace by the Maasai men. We were treated with grace, patience and good humour everywhere we went. My sun hat continues to sit on the hat rack, still coated with the red African dust and there it shall remain, a constant reminder of this unforgettable adventure. Again, thank you so much for all the effort, feedback and encouragement that went in to the planning of this wonderful adventure. Asante sana. Just wanted to let you know that our Tanzania trip was superb. We run out of superlatives for what we have seen and experienced. We can't say enough about driver Lyimo...his knowledge is fantastic, and we learned a great deal. He is a great, safe driver, and very caring about respecting the places we visit. Thanks so far for having planned this great experience for us. Thank you so much for making this trip to Congo happen. At best it was magical. In the other moments it was just great. I was THE ONLY guest in the whole Nouabale-Ndoki National Park! Lots of things have happened to me over the years, but not this. Maybe in 1994 in Marsabit, Kenya, but that is a park the size of a football field! The guides were exceptional. I even enjoyed the rain. I'm happy and proud I made it. You have any other ideas for me? Anything that could match this experience? I have been singing the praises of Mama Tembo ever since I got home from Tanzania. I have cornered people I hardly know and told them the whole story of our amazing safari. I plan to go on a speaking tour once I get my slide presentation up and running (LOL), but seriously, I probably will talk to both horse clubs I belong to. Highlights: Of the driven safari there were so many but I will never forget watching the wildebeest and zebras crossing the Mara River in the Northern Serengeti! The best part was that not one animal got grabbed by a crocodile! Hunting with the bushmen at Lake Eyasi was very interesting as well. I was able to purchase bows and arrows and "smuggle" them home for my grandkids. Every day was an adventure. The most amazing thing about the horseback safari was that we actually galloped with the giraffes (and a couple of zebras joined us as well. I can't really describe the feeling of being able to do this! Truly a once in a lifetime experience! Again, thank you so much for putting this trip together for us." Royal Zambezi Lodge was great and I better understand the high price now! They provide excellent game by road and boat. I may go to Gabon next year for my work. Let me know what you can propose there and what kind of animals you can see. Your publicity is on the newly released Zambia guide in French of "Le petit futé'. Don't hesitate to put me as a recommendation and I am ok to respond to email. I appreciated the time you spent by email to respond my questions. I initially wrote to 5 travel agents in Lusaka and you were the only one to respond to specific questions like mines. You were right, animals prefer to be in the park rather than outside. At the Royal you need one hour drive before really seeing animals, but after this it is superb. Next time I might choose a lodge inside the Park. The trip opened my eyes to reality and how privileged we are in Canada, but also how much we take for granted. I have never stopped to think about the beauty of nature, of trees, plants, soils, birds, mammals, reptiles, etc. until I travelled to Uganda. Not a day goes by where I don't think about my experience there and what it has taught me and I am so grateful to have experienced it with my Grandma. Hands down Uganda, Africa was an experience of a lifetime and something I will remember for the rest of my life! Uganda, Africa will be forever in my heart. We had wanted to take an African safari for several years. 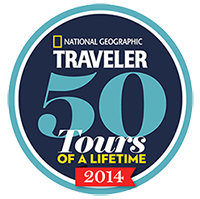 We were disappointed with some of the travel agencies and what they had to offer. One day while scanning the newspaper, we came across an ad for a slideshow by Leslie (Mamba Tembo Tours). By the end of the two-hour talk/slideshow we knew we wanted to go with Leslie. Leslie has knowledge, experience and a passion for Africa. She had us tell her what we had hoped to experience and with her guidance we (along with 3 other couples) came up with our own personal safari. We customized our safari to include healthy doses of both culture and wild life. Mama Tembo and her drivers will take you on roads less traveled so you will experience the true Africa. If Leslie hears that there is a pack of wild dogs, a leopard, or a Simba lion that have been spotted off the beaten track, you will go and try to find them. Once we had a wonderful opportunity to go on an early morning hunt with a group of Hadzabe hunters and then later we spent hours at a BBQ with the Datoga people. On another day, we had an outdoor cooking class to learn how to make plantain stew while in the background young Maasai men danced to entertain us. Or how about standing in the truck with your head stuck through the open roof, eyes glued to your binoculars while you watch a mile- long procession of Cape buffalo lazily wandering through the high grass unaware that just ahead of them a crouching pride of lions awaits patiently. Priceless! Leslie takes care of all the details from meeting you at the airport, to hiring experienced drivers and guides, to speaking with the local people in their own language, to telling you which lens to use to get the best shot. She is a professional in all aspects. You will have an adventure of a life time. Our safari was 2 years ago, and there's not a day that we still don't think about the experience. We will be calling her again. My Tanzania safari was fantastic. Melchior was a great guide. His knowledge of birds added so much to my African experience. I couldn't believe how I felt watching the wildebeest crossing the river. That is something that will stay with me forever. We saw the top nine African animals on the safari. We also saw the total circle of life starting with mating and ending in death. I loved the sounds of Africa. 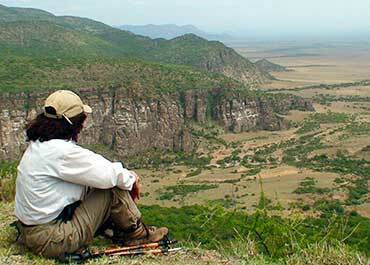 Tarangire National Park was my favourite. The views were spectacular. Thanks again for the perfect African Safari. I will recommend you in a heartbeat if given the opportunity. It is nearly 3 weeks ago now, that we came back and we have really appreciated this trip, it was 2 excellent weeks, we really loved these safaris and people from Zambia. Thank you for the organization, everything was perfectly arranged, and we didn't have to care of anything with the transfer or the drivers, so it was a real pleasure to enjoy the trip. Be sure that if we had to recommend a travel agency in Zambia, we would highly recommend yours! It was really great that you took so nicely into account our demands (especially the "sport" parts with the walking and canoeing), so that this trip met exactly our expectations. Our Congo trip was fantastic. We loved the wild remoteness of the trip, the number of animals we saw, plus the rustic/camping accommodations. The highlight was our incredible experiences observing the gorillas - even better than I was hoping for. We observed 2 different groups over 2 days out of Mondika camp. 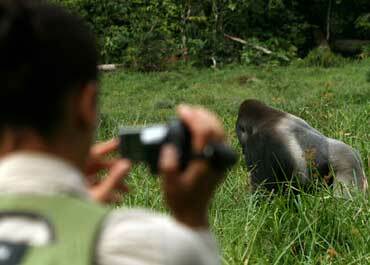 We also saw a number of gorillas at Mbeli Bai. I have been recommending this trip to anyone who will listen.